Click Here to Register your .me today! Dot-me works just like dot-com. Both are called top level domains, or TLDs in techspeak. Dot-com and dot-edu are examples of generic domains. Other examples are dot-net and dot-org. To allow room for growth, the designers of the Domain Name System also created country code domains assigned to particular places in the world. The "ME" in dot-me refers to Montenegro. Will my name .me domain work anywhere in the world? Yes, a .me name works exactly the same as a .COM name, it just happens to have a different ending. It is treated in precisely the same way as .COM by all the DNS nameservers in the world. Why do I want a domain name ending with .me? There are already more than ten million domains registered in the .COM top level domain. Most of the good, short, easy to remember names in .COM are already taken by someone else. The .me top level domain is recently introduced, so there is plenty of new, empty real estate, with excellent names still available. 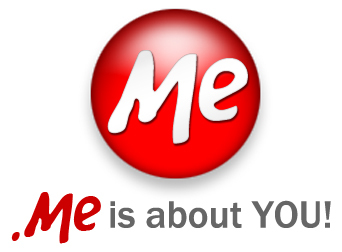 In .me you can have a domain name that fits you, your personality, business, idea, family or other name more closely. e.g. "lookat.me", "WillYouDate.me", "Insure.me", "Shopfor.me", "ChatWith.ME", etc.